First of all, I have to say I'm adding my 12 Days of Christmas items in the order that I find the perfect one, absolutely not in the order of how much I want them. 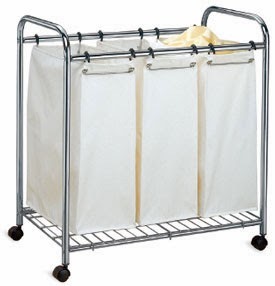 I would LOVE to have this new, very stable looking clothes sorter, but please don't think it's the gift I'd like most in the world this holiday season. The one we are using now is plastic, and I've had it quite a few years. There are some holes in the mesh bags that attach to the stand, and getting the bags attached to the stands is quite frustrating! That being said, it's still in use because I hadn't seen anything else that would suite my needs as well... til now! I first saw this beauty on a blog that I found through a Pinterest pin (are you keeping up with all this?). So a big thanks to Harvard Homemaker for finding what I thought lived only in my imagination for years!